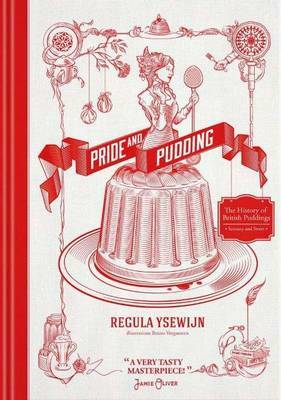 Let Regula Ysewijn's Pride and Pudding take you to the heart of Britishness in this beautiful part-recipe, part-fascinating culinary history book of the British pudding that Heston Blumenthal would be proud of.In Pride & Pudding, food photographer and writer Regula Ysewijn takes you on a journey through the fascinating culinary history of Great Britain. Hailed as 'a truly wonderful thing of beauty...a very tasty masterpiece' by Jamie Oliver, Regula's Pride and Pudding contains over 80 recipes that give the reader an insight into the life and times of the Great British Pudding in its various sweet and savoury forms.Divided into chapters of Boiled and Steamed Puddings, Baked Puddings, Batter Puddings, Bread Puddings and Milk puddings, jellies and ice creams, Regula's refreshingly original book traces the history of the British pudding in all its guises as she delves through historical texts dating from the 14th century. With a distinctly gothic-romance aesthetic, Regula recreates the well-known puddings such as Haggis, Black pudding, Bakewell pudding and Queen of puddings, to the lesser known (yet once popular) puddings such as Snake fritters, Cabinet pudding and Mock plum pudding ice for the 21st century kitchen. With stunning photography and fascinating facts along the way (did you know the Jam Roly-Poly was nicknamed 'Dead Man's Arm' due to the custom of it being boiled in an old shirt sleeve? ), Pride and Pudding is a refreshingly different kind of cookbook that's a must for anybody who delights in British history and British food.